Pocketful of Peppermint This item is on sale. FROM STORE OVERSTOCK - Excellent Condition, Never Used! From Blue Ribbon Designs and shown stitched on 28ct Fawn from Lakeside Linens using Weeks Dye Works or DMC floss and Kreinik #8 Braid 100; Sampler = 135 H x 152 W; the stitch counts for ornaments depend on motif/boxed area chosen. The chart pack contains charting for the sampler and smalls, stitching instructions, stitch diagrams, complete finishing instructions for three styles of ornaments (pillow with fabric back, pillow with linen back with/without beads, and round flat ornaments using finishing forms), and an alphabet/numbers with personalization area. Pocketful of Posies This item is on sale. FROM STORE OVERSTOCK, NEVER USED...From Erica Michaels, out of print chart is in EXCELLENT condition, appears never used, with no markings of any kind and price sticker on front cover. Pre- printed Weavers cloth is included. 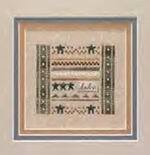 Poinsettia Sampler: Faith This item is on sale. From Wildflower Stitchery & More, published 2007. FROM STORE OVERSTOCK, out of print chart is in EXCELLENT condition, never used, with no markings of any kind and price sticker on front cover. Polly's America - The Finish Line This item is on sale. From Dennis Presents, out of print chart is in EXCELLENT condition, appears never used, with no markings of any kind and minimal writing on front cover. Pomegranate Pocket & Pin This item is on sale. FROM STORE OVERSTOCK, NEVER USED...From Hands On Design, This design has a super fun finish .. this sweet little pocket will hold needles, scissors, even a small project. The pincushion has a unique finishing technique..all instructions included! Pocket is 100 x 50 ; the pincushion is 94 x 94. Pomegranate Sleds This item is on sale. FROM STORE OVERSTOCK, NEVER USED...From Foxwood Crossings, how incredibly cute are these?! Stitched on 14ct Ant. Brown Perforated Paper using DMC or Sullivan's Floss, then trimmed and attached to a cool sled ornament of wood and metal. Wire hanger is 2" long for hanging on a tree. 3 designs in the leaflet. Pond Friends This item is on sale. From Leisure Arts, Leaflet 2139. Out of print chart is in EXCELLENT condition, appears never used, with no markings of any kind and price sticker on front cover.